This story was updated on Tues. Feb. 22. Record crowds by the thousands are expected to turn out Thursday (Feb. 24) to watch NASA's space shuttle Discovery soar to space for the last time. Luckily, a shuttle launch is such a bright spectacle that anyone on Florida's Space Coast can get a decent view. The shuttle is poised to blast off on Feb. 24 at 4:50 p.m. EST (2150 GMT) to make one last delivery trip to the International Space Station. Tickets are scarce, but there are still some steps spectators can take to make sure they have a memorable experience watching shuttle Discovery launch. The best launch viewing spot available to the public is on the NASA Causeway, about 6 miles (9.6 km) from the shuttle's Launch Pad 39A at Kennedy Space Center in Cape Canaveral, Fla. NASA sells adult tickets for viewing from the causeway for $59 ($49 for children), which provides an unobstructed view over the Banana River. However, if you don't already have tickets for the causeway, you're out of luck: Most of the tickets were sold out months ago, when Discovery was initially slated to launch on Nov. 5. Discovery's final mission has been delayed since November due to issues with the shuttle's external fuel tank. The number of people clamoring for spots on the NASA Causeway, as well as at the visitor center itself and the nearby U.S. Astronaut Hall of Fame, was so large NASA instituted a new ticket-selling policy for this final launch of Discovery, Farmer said. People first had to register for a chance to buy tickets to these locations, and then names were randomly selected from the list to purchase the passes. "We did make a limited number of tickets available to view launch from Kennedy Space Center Visitor Complex to a select group of people, selected at random, who registered for the opportunity to purchase space shuttle launch viewing tickets," Andrea Farmer, public relations manager at the Kennedy Space Center Visitor Complex, told SPACE.com. "We are expecting the same number of people as for the November launch [attempt]." And even though the launch has been delayed several times, NASA is expecting many of the original ticket holders to be back this week. "The level of public interest in this launch is quite high," Farmer said. "Through a survey, we found that many of our guests are still planning on attending the launch of space shuttle Discovery this Thursday." But for those without coveted NASA tickets, fear not! Opportunities abound for good viewing beyond the spaceport. All you need is a car and a good map. One of the most popular locations is Space View Park in Titusville, Fla., just across the Indian River from Kennedy Space Center. "I would definitely say go to Titusville – that's the best view and the closest view you can get without having tickets," said Ben Cooper, a space photographer for NASA and other media outlets. "Anywhere along the river is good." Space View Park has the added benefit of an audio feed that plays the official NASA countdown, so people gathered at the site can stay updated on the launch status, Cooper said. Farmer herself said she has watched many a launch from Space View Park before she went to work for NASA. This spot also tends to get the most crowded, though. "It's definitely going to be mobbed in that spot," Cooper said. "There really isn't any place to go to get away from the crowds." Other good viewing locations in Titusville include Parrish Park, on the Max Brewer Causeway between Titusville and Kennedy Space Center. To get a little bit off the (extremely) well-beaten path, viewers can head to Cape Canaveral and Port Canaveral, where cruise ships dock. Other good spot recommendations, as well as photos taken from the various launch sites, are offered on Cooper's space shuttle viewing site here. No matter where you choose to camp out, getting there early is a good idea. Since Discovery is slated to lift off at 4:50 p.m. EST, bet on arriving at your spot in the morning, at least six hours ahead, Cooper said. Parking is likely to be tight all over Titusville, with landowners near the Indian River tending to rent out parking spots on launch day for a small fee. Bringing snacks and games for the long day is a good idea, as well as blankets and chairs, and – of course – a camera. No matter where you choose to watch from, the experience should be memorable. "We want as many people as possible to have the opportunity to see a space shuttle launch," Farmer said. "I hope that whether or not they have a ticket to Kennedy Space Center – please don't miss out on the opportunity. It's just amazing, especially if it's your once-in-a-lifetime experience." And if this time around doesn't work out for you, you still have one – and maybe two – more shots. NASA's shuttle Endeavour is currently slated to launch on its final mission to space on April 19, 2011, at 7:48 p.m. EDT (2350 GMT). NASA has not yet sold tickets for viewing that launch. To be alerted when they open the lottery for the chance to buy passes, sign up here. A NASA authorization bill signed last year by President Obama approved one more flight by the shuttle Atlantis, though that mission must be allocated funding by Congress before it is officially on. This extra trip is slated to lift off on June 28 at 3:48 p.m. EDT (1948 GMT). The crowds for viewing either of these launches will likely be some of the largest ever, so it never hurts to plan ahead. And of course, if you can't be there in person, you can always watch the launch live on NASA TV here: http://www.nasa.gov/multimedia/nasatv/index.html?param=public. 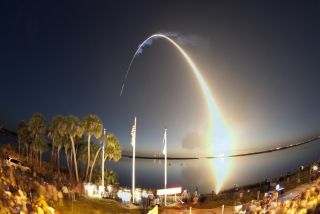 SPACE.com staff writer Denise Chow contributed to this report from Cape Canaveral, Fla. You can follow SPACE.com senior writer Clara Moskowitz on Twitter @ClaraMoskowitz.